Apart from the sunshine, the people and the pizza, it’s the ritual of ‘Aperitivo time’ that we miss most since moving back to the UK from Rome. The Aperitif hour signals the end of the working day, a moment to relax (usually in the sunshine), drink a glass of something refreshing (generally just the one), with a bowl or two of ‘stuzzichini’ (nibbles). It’s a great time for a quick catch up with friends or work colleagues and it’s also often spontaneous – a way to revive a bad day or bring to a close a long and challenging week! 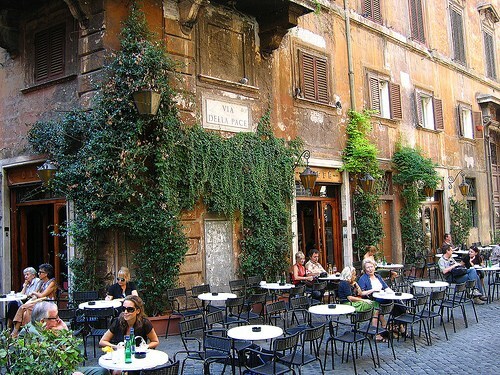 An Aperitivo on holiday is usually a welcome conclusion to a hard day’s sightseeing, a time to take the weight off your feet, to sit down in a beautiful piazza and to make the difficult decision of whether it’s pizza or pasta for dinner later! 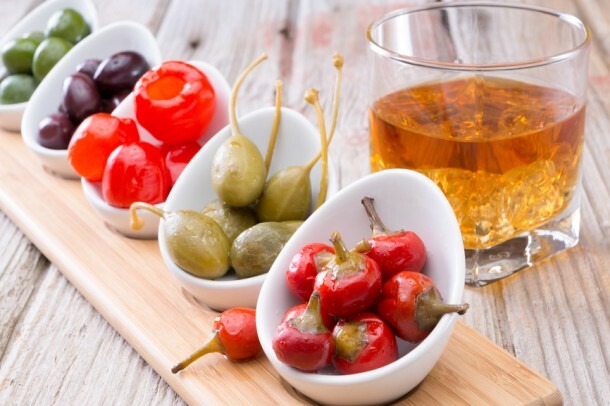 Although the exact origins of the Italian aperitivo are unclear, it seems that the concept was started in Torino in 1786 by the creator of Vermouth, Antonio Benedetto Carpano, but that the trend did not take off until the 1920s in Milan, the aperitivo capital. The word ‘Aperitivo’ comes from the Latin ‘aperitivus’ or ‘aperire’ meaning to open your palate, so technically it’s purpose is to stimulate your digestion before your main meal. Aperitivo time is usually anytime from 7 – 9 pm but it can also happen before lunch too! 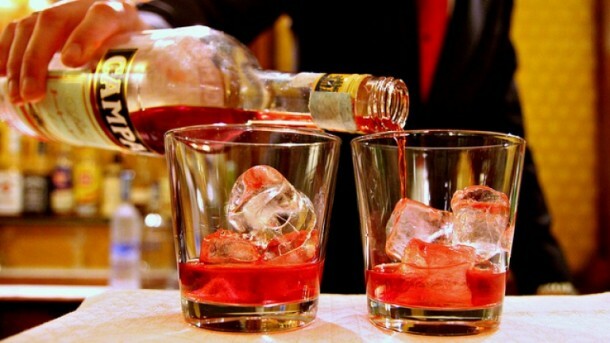 Aperitivo can be ‘alcolico ‘or ‘non alcolico’. On the alcoholic side, drinks are generally speaking not that strong, mainly dry and quite often bitter. Popular choices include Prosecco, Vermouth, Campari or Aperol or a mixed drink such as a Spritz – soda water, prosecco/sparkling white wine and usually Campari or Aperol or maybe a Negroni – gin, vermouth and Campari, decorated with an orange slice. Non alcoholic favourites are the cute little glass bottles of bittersweet Sanbitter or Crodino or a fruit based cocktail often pre-prepared in large jugs. It’s pretty much unheard of in Italy to drink alcohol without food so the aperitivo and nibbles of some kind go hand in hand. What you eat really depends on whereabouts in Italy you are, as aperitivo food does vary enormously from region to region, but anything goes from peanuts, olives or Taralli, to a plate of assorted snacks such as pizzette (mini pizzas) cheeses, cold meats & savoury pastries. These are all included in the price of your drink. Recent years have seen the emergence of the ‘Apericena’ in some parts of Italy. Apericena (a combination of aperitivo and cena, dinner) involves access to an all-you-can-eat buffet (quite often leftovers from lunchtime) and becomes a dinner replacement! Italians, generally speaking are quite restrained at aperitivo time and don’t take advantage of a mountain of food to fill up on, not wanting to spoil their appetite for the all important main meal. The Apericena, not surprisingly has not proved to be as popular as the traditional aperitivo! 5) Not to be confused with..
Don’t confuse an aperitivo with Happy Hour! Aperitivo generally doesn’t run into the rest of the evening and usually there are no offers or discounts to be had! As well as being restrained with the nibbles and buffets, Italians do generally stick to one or two drinks. So you may not have the sunshine at the moment or the beautiful piazza setting but there’s no reason not to enjoy aperitivo time at home! Create your own aperitivo spread with a platter of Vorrei’s Calabrian green and black olives, sun dried tomatoes in olive oil, shredded aubergines, caper berries and some tasty bruschetta topped with pate’ or drizzled with infused oil along with a bottle of crisp organic Prosecco. There’s no better way to start the weekend!